When our company went virtual at the end of 2016, I was concerned. It had been eight years since I worked from home and I wasn’t sure I could go back. The office gave me separation between my home and work life, it put me in “work-mode” as soon as I walked through the door, and I enjoyed being in the same room as the team. I was worried that without the physical structure of an office, my productivity might suffer. But I knew giving up the office was the right move, since we had so many meetings outside the office that keeping the office wasn’t worth the expense, so I gave it up. It did take some getting used to, but as soon as I worked out my routine, I learned that I was more efficient, productive, and had more work-life balance. By cutting out my commuting time, I was able to make the most of every minute of the day, which meant working fewer hours and having more time for myself. 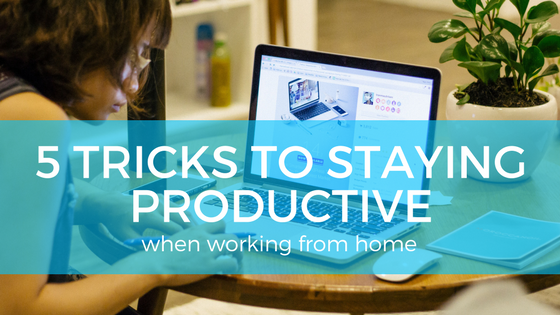 Whether you work remotely full time or your company allows you to work from home on occasion, here are some tricks I learned to stay productive while working from home. I’m fortunate that we had a spare room I could use as an office, but when I first started Kaye Publicity, my “office” was our dining room table. But whether you’re able to create a dedicated office or have to make room in a common area, it’s important to have a space dedicated entirely for work. The first reason is that when you sit down in your dedicated work space, your mind will automatically shift into work mode. We’re creatures of habit, and having a dedicated “office” will put us into the habit of work. Now, I’m not saying I never take my laptop to the couch or go work in a coffee shop, but mostly, I start my day in the office. The second reason it’s important to have a dedicated space is to create separation between home and work. Personal items should stay out of your work space and work-related items should stay out of your personal space. This helps you avoid working on the weekends or getting distracted by personal responsibilities when you should be working. Sure, working from home can be advantageous when you need to schedule appointments during business hours, but it’s important to create boundaries. For example, I allot one hour a day (usually during lunch) to take care of personal business. But when I do that, I step out of my office and do everything on my personal computer and phone. Separation is crucial to productivity. This is especially important if you don’t work from home full time as it can be difficult to find your rhythm when working from home is not habitual. Like a dedicated workspace, having a routine will get you into work-mode quicker and increase your productivity. This can be a small thing like journaling or filling out your day planner before turning on your computer or checking email while you drink your first cup of coffee. It can also be the way you organize your week. For example, I strive for no-meeting Mondays to allow me to get a jump on my week and give myself time to dig out from what came in over the weekend. Tuesdays are writing days (blog posts, newsletters, etc.) so I work off-site which allows me to focus and eliminate distractions. Fridays are for bookkeeping and tying up loose ends. Whether you have a routine for your day or your week, sticking to that routine will ensure you stay on track and remain productive. When I first started working from home, I had this idea that I’d be able to get SO much more done. I could do laundry in the morning, work out every day at lunch, and prepare dinner every night. But if I didn’t have time to get those things done when I had an office, why would I expect to suddenly have enough time to do those things just because I was working from home? While working from home cuts down on your commuting time (and maybe for some of you, that’s 1-2 hours back in your day), it doesn’t mean you suddenly have 27 hours in every day. Don’t think that just because you’re working from home that you suddenly have the capabilities to do more around the house (and make sure your significant other knows this too!). If you set unreasonable expectations, you’re setting yourself up for stress and disappointment. Work the same hours you did when you were commuting and if you don’t have time to get dinner ready or throw in a load of laundry, that is 100 percent okay! Build in breaks, avoid distractions. It’s important to take regular breaks throughout the day, but sometimes when you’re working from home, we have a tendency to forget. I used to head up to my office with a pot of coffee and a huge pitcher of water so I could avoid going down to the kitchen every hour. And while that did cut down on time spent going back and forth to the kitchen, I still needed to take small breaks in between projects. So I’d end up checking social media or slipping into my personal email, which would always end up taking WAY more time than running down for a coffee refill. So instead, I head up to the office with a single mug and a cup of water, and let my need for refills dictate my breaks. Not only does this help me avoid getting distracted, it ensures that my mini-breaks are spent away from the computer. While working from home means avoiding the inter-office chit-chat, it doesn’t mean all communication should cease. I enjoy having time without meetings to write or dig into a big project, but that doesn’t mean I never reach out to my team for feedback and questions. If you have a team, it’s important to stay in communication with them through chat, Slack, email, or video conference. If you’re a solopreneur or creative, make an effort to build a network of people you can brainstorm and collaborate with. Human interaction is important for productivity and problem-solving. Working from home doesn’t mean you’re working alone; it just means you need to make the extra effort to communicate. 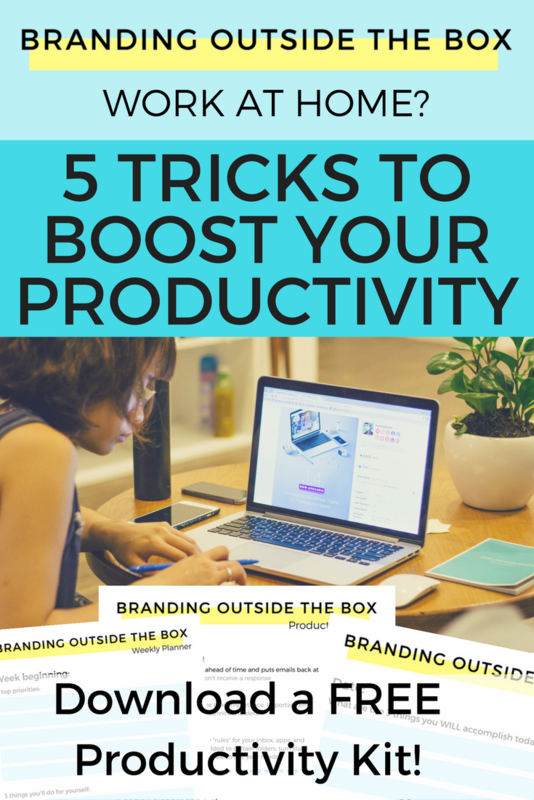 Since going virtual, I have enjoyed the ease and flexibility of working from home, but without these five tricks, I wouldn’t be as productive as I could be. Do you have a favorite tip for working from home? Feel free to share it in the comments!